I had to try making this recipe after i saw it in a cookbook because it looked so good. 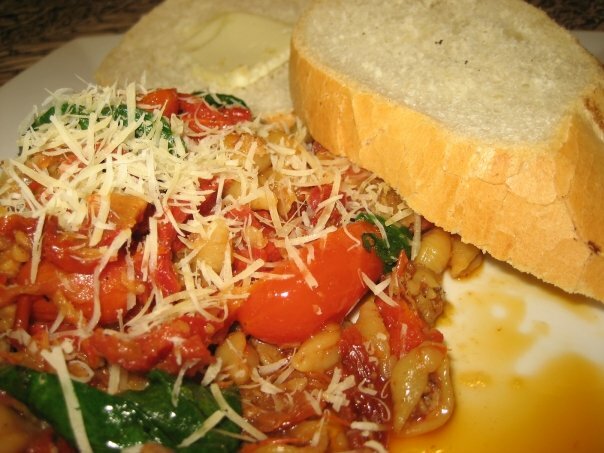 But I put my own twist on it by substituting meat with veggie meat and instead of orecchiette pasta I used sea shell pasta, and then French bread on the side. This is one of my husband's favorite dishes that he's always asking me to make. 1.Cook sausage. Cook sausage in skillet over medium-high heat 8-10 minutes, breaking into crumbles. Drain canned tomatoes using a colander into a large bowl; reserve 1 cup of the tomato liquid for later use in the recipe. 2. Cook Pasta. Add drained canned tomatoes, tomato liquid from large bowl, pasta, water, pressed garlic, pepper flakes, if desired, and salt to skillet. Cover and cook for 13-15 minutes or until pasta is tender, stirring occasionally. 3. Add remaining ingredients and serve. Meanwhile, cut grape tomatoes in half. Grate cheese. Add grape tomatoes, spinach and reserve 1 cup tomato liquid to skillet. Cook 1-2 minutes or until spinach is wilted, stirring constantly. Sprinkle with cheese. I hope you try making this and let me know how it turns out! This is a really good dish. I ask her to make this all the time. Im gonna try this! and Im sure its good!